After staying up late the last couple of nights working on this shirt project, I finally finished it this morning. 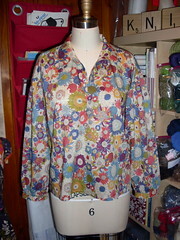 I just had to sew the buttonholes and buttons on, but there were only five, so it didn't take too long. I like how the shirt turned out, but it is very loose-fitting, even though I made the smallest size. And since I took off a bunch of the length, it looks a bit boxy to me, especially with the dropped shoulders. I do like that I can easily pull it on. I think I'll still get a lot of wear out of it.